Weekends Count Magazine - Education & Family Travel: Crafting Your Weekends with Our Top Five KidKraft Outdoor Products from Amazon! Crafting Your Weekends with Our Top Five KidKraft Outdoor Products from Amazon! We are advocates of KidKraft products! Everything that we've purchased: outdoor sandbox with retractable screen, book shelf for our nursery, pink storage stool, desk for toddlers, and many other items have been the best (no regret) purchase for our little one! 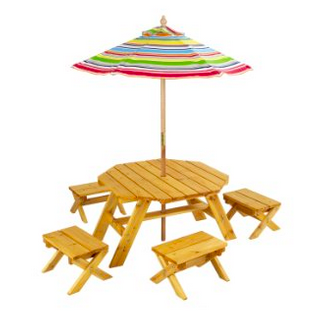 Here are our "Top Five KidKraft Outdoor Items for Your Little Ones". 1 - KidKraft Double Chaise Lounge ($97.99 at the time of this post). Isn't this the cutest? Wonderful for sunny days by the pool or on the back porch after playing in the sprinkler. Love this! We love toys that function as temporary porch/deck and indoor items (great for summer and winter). Your kiddo will probably love this teepee in his/her room as well! This outdoor item is also great for storage of small toys when the weather is rainy! We love Little Tikes toys, but we also love wooden toys as well! Too cute for kiddos! I only wish they had this chaise in an adult size! So cute! Enjoy these super cute items! Yes, they are a little more expensive than most outdoor items for children, but they will be in great shape for years to come. Amazing resale value as well!